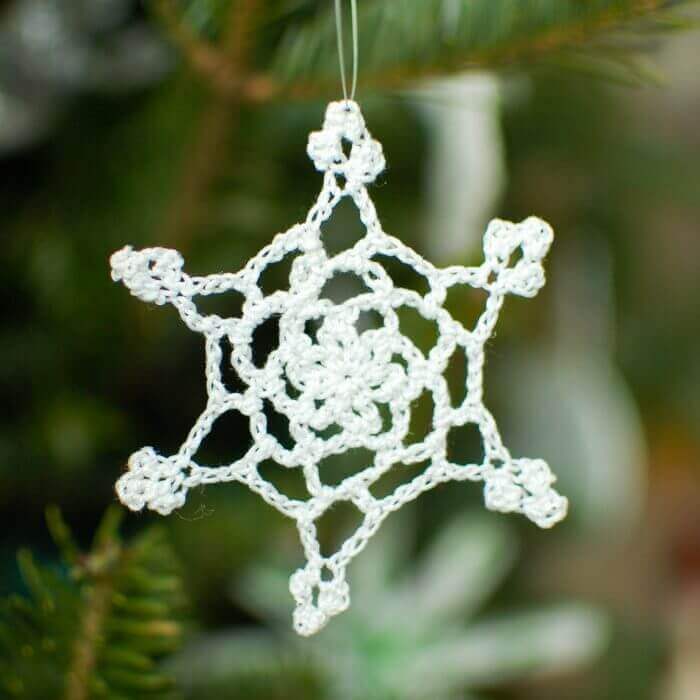 This dainty lace snowflake is the smallest of the 4 snowflake designs I recently shared with you, measuring a little over three inches. It features an open lacy design centered around a flower motif. It pairs especially nicely with the pretty picot snowflake here! Finished snowflake is approx 3¼ in. Ch 4, join with Sl st in furthest ch from hook to form a ring. Round 1: Ch 1 (does not count as st), *work 1 sc into ring, ch 4, rep fr * 5 more times, join in 1st sc of round — 6 ch-4 spaces. Round 2: Sl st in next ch-4 sp, ch 1 (does not count as st), 1 sc in same ch-4 sp, ch 4, *1 sc in next ch-4 sp, ch 4, rep from * around, join in 1st sc of round — 6 ch-4 spaces. Round 3: Sl st in next ch-4 sp, ch 1 (does not count as st), 1 sc in same ch-4 sp, ch 6, *1 sc in next ch-4 sp, ch 6, rep from * around, join in 1st sc of round — 6 ch-6 spaces. Round 4: Sl st in next 2 ch, ch 6 (counts as dc plus ch 3), [tr-p, ch 3, 1 dc] in same ch-6 sp, ch 3, *work [1 dc, ch 3, tr-p, ch 3, 1 dc] in next ch-6 sp, ch 3, rep from * around, join in 3rd ch of beg ch 6 — 6 tr-p. This is soooo pretty, Kara!! This is so delicate and pretty 🙂 Thanks for sharing!